April 3, 2014 - Fast Lane Russia received the Cisco RCIS Learning Partner of the Year and the Cisco MEAR Learning Partner of the Year Awards at 2014 Global Learning Partner Conference, March 23, 2014, in Las Vegas. In addition, Fast Lane Russia received a further Cisco Quality Distinction award for the delivery of consistantly high quality training with average customer satisfaction scores above 4.6 annually. 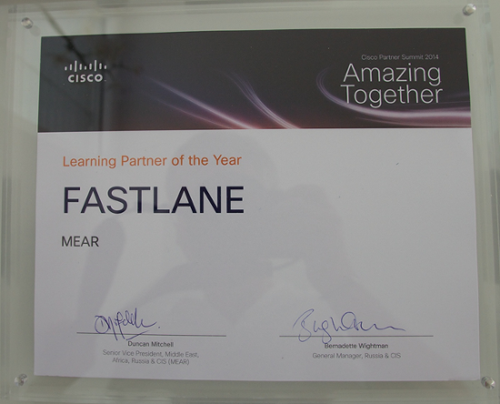 Cisco Partner Awards recognize Fast Lane’s achievement and alignment to Cisco as an outstanding Learning Partner in the Middle East, Africa, Russia & CIS (MEAR) region and the overall commitment to the highest-quality training and enablement. 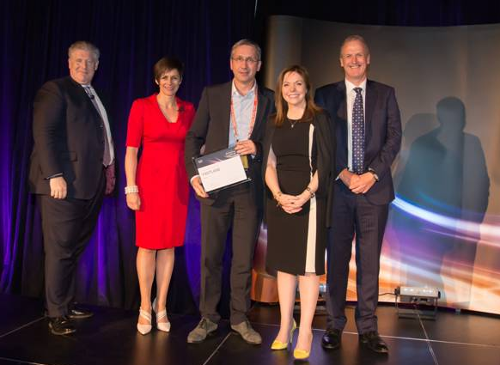 Duncan Mitchell, Senior Vice President, MEAR, Cisco; Emma Roffey, Director, Marketing and Commercial & Partner Organisation MEAR, Cisco; Oleg Feldmann, Managing Director, Fast Lane RCIS; Bernadette Wightman, General Manager, Russia & CIS, Cisco; at the MEAR Award Dinner, March 25, in Las Vegas. The Cisco Learning Partner of the Year RCIS Award was presented to Oleg Feldmann, Managing Director, Fast Lane RCIS by Sergey Chernovolenko, Managing Director, Cisco Russia and Alexey Romanov, Channel Director, Cisco Russia at the Russian Award Dinner, March 24, in Las Vegas.